Slip and Falls, Food Poisoning, Burns, Discrimination And Other Personal Injury Claims. It is difficult to list the variety of restaurants available in Florida, and how many food and drink establishments operate here. A telling statistic: according to the National Restaurant Association, Florida’s restaurant industry employs 10% of the workforce of the entire United States. Obviously, Florida’s food service is a profitable undertaking as it generated over $41 Billion in revenue in 2017. What does this mean to a restaurant injury victim? Food service is a well-funded industry with a large trade association that looks to protect its members. Meaning, companies insuring restaurants have sophistication in dealing with injury claims. They often low ball these claims to achieve two goals: minimizing their payout, and maximizing their profits. The most common accident in a restaurant involves someone losing their footing and suffering an injury from some type of transitory substance on the floor. The second most common fall occurs in the restaurant parking lot due to a wheel stop, ramp or inadequate lighting. 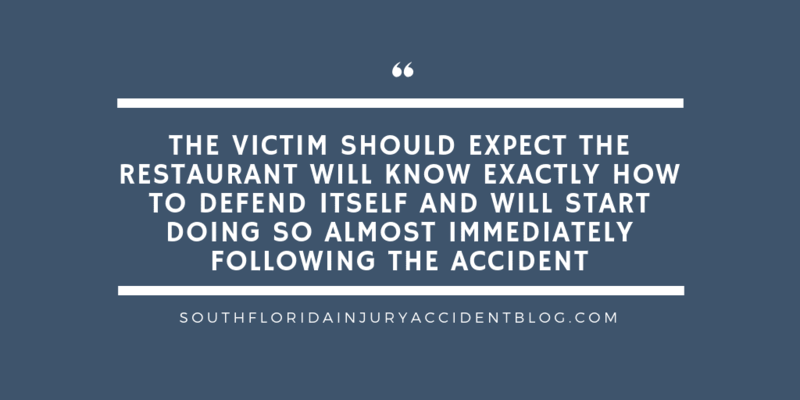 Since these are common claims, the victim should expect the restaurant will know exactly how to defend itself and will start doing so almost immediately following the accident. The restaurant manager, for instance, may have training in how to document the scene, as well as what questions to ask the victim, and who to contact at the insurance carrier for a prompt response by the claims adjuster– all before the victim has even had the opportunity to seek medical care and treatment! Anyone suffering injury in a Florida restaurant slip and fall must be aware not only of their right to pursue a claim for damages against the restaurant, but that their assertion of their legal rights may be fought hard by an aggressive defense. The food service industry is highly regulated regarding the care and control of all its food items, especially perishable ingredients like seafood and produce. The risk is high for restaurant patrons to suffer internal injuries and serious illness if proper oversight is not undertaken regarding the food itself. Restaurant patrons can be harmed both by food contamination (like the recurring dangers of bacteria in lettuce) as well as food poisoning. The danger of injury resulting from food poisoning in a Florida restaurant is a serious matter, particularly when there is the chance that several patrons may be harmed. In fact, the risk to public safety here is so high that the federal government maintains a site asking for reports of suspected food poisoning at FoodSafety.Gov. Food injury claims against Florida restaurants can be complicated in many ways, not only from determining the source and cause of the injury, but also in defending against arguments that another food source contributed or caused the illness. These cases involve investigation into the source of the illness, as well as determining how and why the victim became ill and was harmed by the particular food item. Restaurant food poisoning victims should be prepared for an aggressive defense by the business. That is because the restaurant is not only facing monetary damages but also concern over the possible taint to its reputation and business goodwill from public knowledge that a patron fell prey to poisoning at its establishment. For more on food poisoning claims, see our discussion on food poisoning. Akin to a slip and fall claim against a restaurant is a cause of action based upon the victim losing their balance and falling out of a restaurant booth. Sadly, some of these booth accidents can be tragic, especially if they involve infants or small children who are vulnerable to serious injury or even death from falling out of a restaurant booth. We have delved into these dangers in greater detail earlier. For more on restaurant booth claims, see: Hurt in a Florida Restaurant After Falling Out of the Booth: Do You Have a Claim? Some restaurants are particularly high risk for serious burn injuries because of their particular theme or flair. There are dangers inherent in serving fajitas on hot metal platters, for instance. Flaming desserts like the popular Bananas Foster are dangerous burn risks when prepared by a server at the patron’s table. For example, several years ago restaurant patrons suffered serious burn injuries at a Tampa restaurant when the server added too much rum to the table-side dish, causing huge flames to burst from the pan, burning four of the restaurant’s guests. Burn risks are high in restaurants that offer patrons open Japanese-style grills, as well. A notable example here is the lawsuit filed by actress Tori Spelling for burns she suffered at a Los Angeles Benehana restaurant. However, any Florida restaurant serving hot food runs the risk of a patron suffering a serious burn injury. Even a hot cup of coffee can cause serious harm if the server spills it on the restaurant patron. In Florida, burn injuries are particularly difficult claims because the harm is so severe. Even minor burns that are not life-threatening can involve extensive medical care and treatment over several years. There is scar tissue to consider, therapy to cope with loss of function or mobility, and the psychological treatment needed for many burn victims dealing with disfigurement. Restaurant owner and operators owe these burn victims a duty of care to protect against burn injuries which the victim must establish in their claims as being breached by the establishment in a manner that caused the accident. Premises liability lawsuits in Florida are government by statute and must be pursued in a particular manner with a higher burden on the claimant than exists in other states. For more, see our discussion as well as: What Happens When Someone Is Injured at a Business or Commercial Location? Florida Premises Liability Law. Many food establishments offer alcoholic beverages to their patrons. The restaurant may be a local bar and grill, or it may be a full service restaurant. Some offer alcohol as an accompaniment to their sit-down menu and others offer separate areas, where restaurant patrons can wait for their tables to be ready. If a restaurant patron leaves the premises drunk, and then is involved I a motor vehicle accident, then the restaurant can be held liable under Florida’s dram shop law. Restaurants are also vulnerable to legal liability when someone is a victim of an assault on the restaurant’s premises. Consider the case of Jennifer Bellevue in Bellevue v. Frenchy’s South Beach Cafe, 136 So. 3d 640 (Fla. Dist. Ct. App. 2013). Frenchy’s South Beach Café, Inc. (“Frenchy’s”) was a popular Clearwater restaurant with a full bar that was located one block away from the beach. It was a popular spot with both the locals and with tourists alike. Shelly Kneuer worked at Frenchy’s as a bartender. One evening, not long before closing time, her roommate Jennifer Bellever showed up at Frenchy’s to give Shelly a ride home from work. When Jennifer arrived at the restaurant, the only patrons in the place were a group of tourists. They were a family visiting from Ireland, and they were having a grand time. Testimony at trial was that the family members were “rowdy” and “disorderly” and had been drinking quite a lot. Aside from the tourist family, the only people in the bar when Jennifer got there were her roommate Shelly, the restaurant manager, Jonathan Kirby, and Jennifer’s friend Christopher Malek. An altercation ensued between Mr. Malek and one of the family members. At first, it was just words. The manager saw and heard all of this, and told Mr. Malek to leave things to Shelly the bartender. Then the manager left the bar, to go upstairs for his usual evening routine of closing out things. Things got louder and more hostile. Shelly tried to resolve things, but she was a “petite woman” and soon one of the tourist family members shoved her. Jennifer and her friend Christopher Malek jumped to help Shelly, and things turned into a fight. The police were called. By the time that law enforcement arrived, Jennifer Bellevue had sustained severe personal injuries from being beaten in the fight. The police arrested all the family members. Unfortunately, they escaped the country and returned to Ireland while out on bail. This left Jennifer Bellevue with the only option of suing Frenchy’s for damages sustained in the assault. Her legal argument was negligent security: Frenchy’s management was on notice that its patrons had a propensity to become violent, and that it failed to maintain adequate security to protect its patrons. She investigated and sought to introduce evidence that there had been 60 prior incidents of fights and violence inside Frenchy’s or nearby the bar’s premises in the past 4.5 years prior to her assault. The evidence consisted of police reports or notations found in Frenchy’s management logs during the discovery process. Jennifer’s security expert provided his analysis of this evidence, to opine that the restaurant was negligent in providing security and protecting her from being harmed by the violent fight in the bar. (10) the police having to be called because two patrons were about to fight. At trial, Frenchy’s attorneys fought hard to keep as many of these incidents away from the jury as possible, and succeeded in getting all but 12 of the 60 incidents excluded at trial. On appeal, Jennifer successfully had that ruling reversed, with all the incidents being allowed into the case. The defense argument failed. Jennifer was allowed to enter all incidents into evidence and her security expert was allowed to discuss them as part of his opinion that Frenchy’s provided negligent security on the night she was hurt and therefore was liable for her injuries resulting from being beaten by another restaurant patron. Restaurant injuries need not be physical in order to be legally compensable here in Florida. Under both federal civil rights laws and Florida Statutes 760.07- 760.08, those who are the victim of unlawful discrimination by a Florida food service establishment are liable for damages, too. In federal law, a “place of public accommodation” is defined to include any business or facility providing lodging, food, entertainment, sales, rental services, recreation, health care, or other professional services. See, 42 U.S.C. §2000a. Claims based upon federal discrimination statutes are filed with the federal district court. In addition to these civil claims for monetary damages, the victim of discrimination in a Florida restaurant can also file a formal complaint with the Justice Department’s Civil Rights Division. There is Florida state law independent of the federal civil rights law which also protects against anyone being discriminated against as a patron of a Florida Restaurant. Under Florida Statute 760.08, “all persons” are entitled to the full and equal enjoyment of the goods and services as well as any facilities, privileges, advantages, or accommodations provided by a Florida restaurant. It applies to all public restaurants, and many private ones. Discretionary attorneys’ fees to be interpreted by the judge in a manner consistent with a federal civil rights (Title VII) action. Deciding To Sue A Restaurant In Florida? Victims of a discrimination based or negligence based injury in a Florida restaurant must be prepared for a battle with a well-funded industry. An personal injury victim has the burden of proof to (1) establish the restaurant owner or operator was negligent (for slip and falls, the victim has to prove the owner knew, or should have known, about a dangerous condition) as well as (2) proving their injury and the extent of their harm. They will need to be ready to deal with an insurance adjuster who is likely to not return their calls or make them a low ball offer. Furthermore, if a personal injury lawsuits is needed to get justice, then some of these lawsuits require an expert to testify in order to prove the defendant was negligent (e.g., medical experts in food poisoning cases). Therefore, if you or a loved one have suffered a personal injury in a Florida restaurant, then then a good piece of advice it to speak with an experienced personal injury lawyer before you file a claim to learn about some of the issues that can arise with these claims, including the type of evidence needed to prove a claim and to learn how most insurance companies deal with these matters. Most personal injury lawyers, like Alan Sackrin, will offer a free initial consultation (over the phone or in person) to evaluate your claim and answer your questions.